Also moves associated PST file items like contacts, calendars, journal, etc. The most secured format to save data is a PDF file format and Outlook to PDF converter do the same task. It exports the data (emails, contacts, attachments, calendars, etc.) presented in PST file into PDF file format. Notably, this tool heeds of the attachment data and export them as well. Sometimes deploying the conversion and other relevant tasks with Outlook data file become difficult, if it is corrupted. Outlook to PDF converter solves this issue by scanning and repairing the data. Scanning through "Advance" modes have been integrated within this tool to deal with such data. Most of the times, we are unsure about the PST file and data that it does contain. This can can create complication in a long run. To unravel this and preview what data your PST file has, PST to PDF converter displays the entire data items on the software interface. The software loads all the Outlook items in their stipulated section like, Contacts in Contacts section, Emails in Mail section, Calendars entries in Calendars section, etc. If you have implemented the above given features and now on the brink of conversion. Or, if want to export only specific data of Outlook Items into PDF format, then select the items and hit on export button which appears after a right click. In some ways, exporting entire Outlook data does not appropriate rather than converting selective numbers of folders from PST file. For the same, this utility allows user to cull the selected Outlook folders from the entire PST file to export during final execution. Systematized data, whether it is in PST file format or its been converted into PDF file format provides us an approachable way to understand the context of Outlook items. Naming Convention is one of that features through which a user can define the format to export and save Outlook emails into PDF. Some of them are: DD-MM-YY, Auto incremental, etc. Suppose, you want to transmit the data to an external drive after converting into PDF format using this tool and move it to tangle path by mishap. To get rid of such scenarios, this tool gives you privilege to create a new folder while exports Outlook emails into PDF format. Earlier this month, I had to convert my some important data into PST file and Outlook to PDF Converter simply exported those data into PDF. Resultant PDF files also have their attachments embedded in it. As a Lawyer, I always keep my Outlook emails into PDF formats so they could not be manipulated by others anyhow. 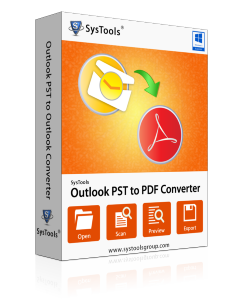 I used this tool for converting my crucial Outlook data into PDF and never encountered any bug.